"Reflecting on what I've been through in the last year, it's quite a phenomenal achievement"
Novak Djokovic admits regaining world No 1 after a two-year absence is "a phenomenal achievement" and even he has been shocked by his own personal landmark. 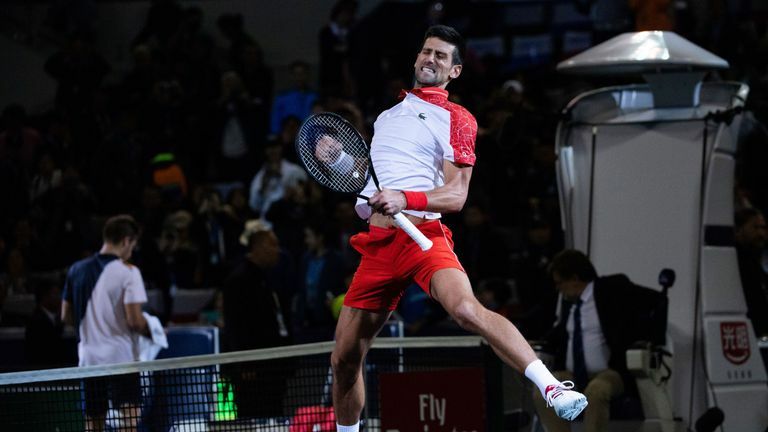 Djokovic celebrated his return to the summit of world tennis by reaching the Paris Masters quarter-finals on Thursday and looks well set to claim a record-extending fifth title in Bercy. His Bosnian opponent Damir Dzumhur was forced to retire trailing 6-1 2-1, allowing the Serb to extend his sequence of consecutive winning sets to 30, passing his previous best mark of 29 from 2015. Djokovic will replace Rafael Nadal as the world's top player on Monday and even the 31-year-old admitted being blown away by his latest accomplishment. Five months ago, it was highly improbable considering my ranking and the way I played and felt on the court. "Reflecting on what I've been through in the last year, it's quite a phenomenal achievement," said Djokovic, who won Grand Slam titles at Wimbledon and the US Open this summer. "I'm very, very happy and proud about it. Five months ago, it was highly improbable considering my ranking and the way I played and felt on the court. "I'll probably be able to speak more profoundly about it when the season is done and hopefully if I get to finish as number one." Djokovic, who next faces Marin Cilic in the last eight on Friday, was guaranteed a return to the ranking summit when Nadal withdrew from Paris with an abdominal injury on Wednesday. "It's not the end of the season. Rafa obviously is struggling with injuries since the US Open. But the race is still there," added Djokovic. "Roger (Federer) is in the race. Rafa is in the race. It depends who is going to play the ATP Finals in London. So as I said, I can't be too ecstatic about it."